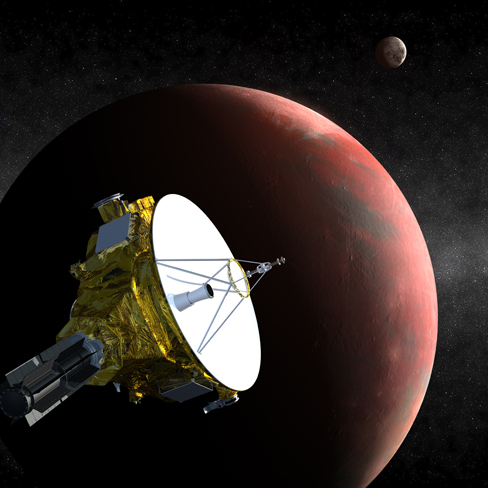 Five years ago, the New Horizons spacecraft was in a thermal-vacuum chamber at NASA Goddard Space Flight Center, Maryland, being tested for our historic voyage to the planetary frontier. Today our intrepid probe is a billion kilometers past Saturn – and exactly five years away from closest Pluto approach on July 14, 2015. Thanks to everyone for the hard work, dedication, persistence, and sheer pluck that got us funded, built, launched and halfway across the solar system. We aren't "turning final" on approach yet, but we can see that day coming in early 2015. Go New Horizons! July 14, 2015: New Horizons at Pluto.